Purpose built in 2001, Barton Marina is privately owned and we are very proud of the reputation we maintain as the finest inland waterways marina in the UK. Permanent, centrally-heated buildings house our showers, laundrette and marina office. Our workshop facilities are second-to-none, with a hydraulic boat lift giving quick and easy access to the dry dock. As you will see on this website Barton Marina isn’t just a place to moor your boat, we have entertainment and events throughout the year. “The Waterfront” pub & restaurant presents locally-sourced good food daily and has 6 guest real ales on offer. With 12 other shops & businesses in the marina many visitors remark on the holiday atmosphere. Barton Marina has over 300 berths available for permanent and temporary moorings with residential by arrangement. Access to the jetties is for boat owners only, using a PIN code system to enter the security gates. Each jetty has a water supply and each berth has its own electrical hook-up. Long-term gated car parking is available to moorers. 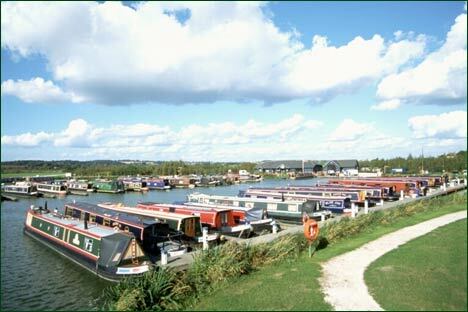 Situated between Fradley Junction and Burton on Trent, on the Trent & Mersey Canal, Barton Turns is a new marina opened in 2001. It is on an 85 acre site that was originally owned by the local company Douglas Concrete and was used for gravel extraction that resulted in some lakes. After that the land was obtained by Barry Morgan, who is now Managing Director of the private limited company that runs the marina. Planning for the marina began in the early 1990s and the construction started in 1999. Land & Water were contacted to install all the jetties and other water space structures while the rest of the site was constructed by local builders and architects. Keith and Sue Harpham (right)are the husband and wife team who run the marina and it was their boat that was first to enter the marina when the stop planks were lifted on 15 August 2000. The facilities building and workshop were not completed until after Easter 2001 when the marina became fully operational. Within two years the moorings were full and there is now a waiting list. Keith and Sue have been boating since the eighties and built their current boat themselves in 1996. Originally they had a unit at Burton on Trent where they were fitting out boats and at the time the marina development started found they were looking for bigger premises. This led them to take on the management of the marina. There are over 300 berths at Barton Turns which were originally fitted with a computerised system for the monitoring of electricity to all the berths. Unfortunately the system had software problems and never worked properly so it was removed and now electricity is supplied as part of the mooring fees which are now an all inclusive charge based on the length of jetty rather than on the boat. The marina has its own set of keys giving access to facilities, these replaced the BW keys that were used for this purpose after it was found that various unauthorised people were making use of the facilities and the marina suffered a spate of minor thefts and vandalism. The marina is the base for Shakespeare Classic Line, a fleet of 20 timeshare and hire boats belonging to a Leamington based company who have their own receptionist for their guests and provide their own contract cleaners for the boats. The marina provides the narrowboat servicing and tuition for guests using the boats. These attract a lot of overseas visitors and are used throughout the year. They turnaround on four days a week so that there are never more than six boats going out on one day, which spreads the load for both the marina staff and for the use of the local locks. The marina employs seven staff plus some yardmen, who are all retired men doing two days a week. Part of the yardmen’s duties is giving tuition to the Shakespeare Classic Line boaters and ensuring that guests have a sufficient degree of skill before they take the boats away. This includes operating a lock and if a sufficient degree of competency is not reached they go through the procedure again. Some Ownerships share boats are also based in the marina and make use of its facilities. All the berths have electricity and water and there are toilets (including disabled and baby changing facilities), showers, a token operated launderette, shop and chandlery and all available in addition to the usual diesel, gas and pumpout services. They also have a hydraulic boat lift which will take any size boat out of the water and up the slipway into the workshop. This was built by the marina company and is driven by a fixed chain mechanism that controls both lifting out and launching processes. Although they offer repair services they do not take on major steelwork jobs, or fabrication work. This can be tackled at Streethay Wharf, which is not far away and specialises in this type of work. A further phase of development is planned for the marina which will consist of a traditional style public house with a raised decking so that customers can sit outside with a view across the marina. It will provide bar meals and have a 220 seat restaurant downstairs with a similar sized function room and restaurant upstairs for private and corporate bookings. There will also be seven craft shops, two other restaurants (of different types to offer a good choice, e.g. Italian and Thai), some office accommodation and a large car park. Construction is scheduled to start in November 2005 and opening for June 2006. Beyond this a further development of a hotel and leisure facilities is envisaged on the land between the marina and the lake. The large site, part of which has been planted as part of the National Forest, also has potential for further attractions and recreational use.